Google Chrome introduced extensions allowing users to add more functionality by installing different Chrome extension like to see latest cricket scores, check webpage page rank and much more. If you happen to install lot of Chrome extensions, make sure you update those extensions using manual or automatic extensions update methods. 1. Launch Google Chrome browser on the computer. Then click on icon at top right and goto Tools > Extensions option (or type chrome://extensions/ in the address bar). This will open Extensions page showing all installed extension in the Chrome browser. 2.. Click on ‘update extensions now’ button at top right. This will automatically download latest update to all extensions in the background. Just one click to update all extension installed in your Google Chrome browser, that is handy for sure. 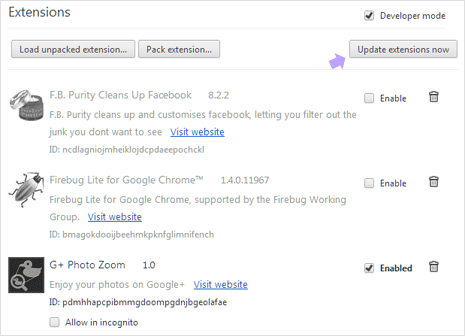 If you want automatic notifications for Chrome extensions updates within browser, then install Extensions Update Notifier. It display notifications for updates install to various extensions. It works for both active and disabled Chrome extensions. You can always uninstall and remove Chrome extensions that are no longer required for use. Otherwise make sure installed Chrome extensions are updated for proper functionality. Chrome extensions do auto-update, and Extensions are not same as plugins. Secbrowsing is for PLUGINS not extentions. —> ‘” Improved plugin performance and reliability. Spell checking for input fields. Improved web proxy performance and reliability. Tab and window management updates. “, for version 0.3 (2008-10-29). So in short… I THINK that plugins made by 3th parties to supply “default’ services for their properietair service (like flash, adobe, …). If not provided by the Chrome browser itself (like Flash with version 5), then it has to be run as an insecure process, managed outside the sandbox. Extensions on the other hand are written for the Chrome Extensions Galery. The sourcecode is public???? Viewable for other programmers??? And they can run INSIDE the sandbox?? ?